Yes, I’m still around and still flying. I did finally finish the Annual Inspection of the Swift at the beginning of this month and have flown in a couple of times since then. 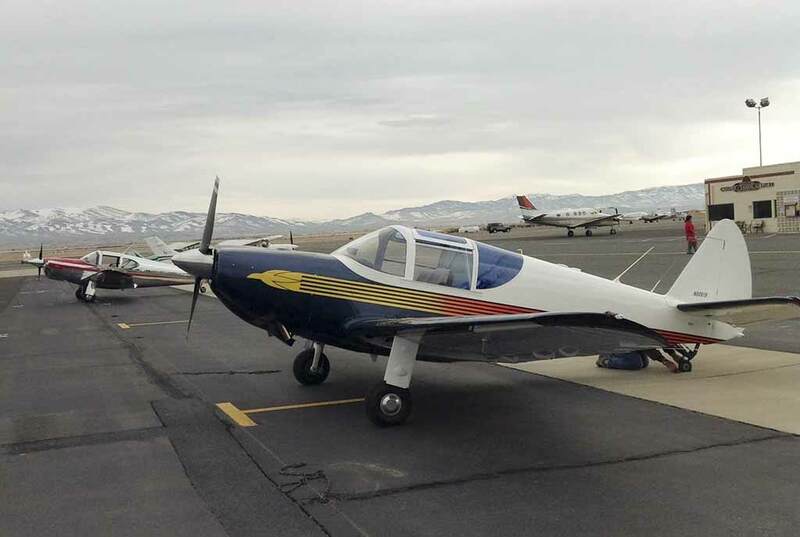 Once to renew my landing currency (it had been 95 days since my last flight) and the other to have lunch with a couple of friends in Minden, NV. It was sort of a mini-fly-in. there were 4 Swifts on the field – the two parked in the middle are painted in a new stealth camouflage paint. Actually, they were in hangars, though one of the owners joined us for lunch. It seemed to take forever to complete the annual inspection – I set a limit to only go out to the hangar and work when the temperature was supposed to hit 50 degrees (F). This year we had some really cold weather – though not a whole lot of snow to go with it. There is still a little around in the deep shadow areas, but not much. The mountains got a bunch early, but haven’t had much since early in the skiing season. One more lesson on not having the annual due during a winter month if you have an unheated hangar. On the way back from Minden I flew by Pyramid Lake and noticed that the water level is up quite a bit from last summer, which is really nice to see. I noticed an article in the local newspaper (online) that the Lohontan Cutthroat Trout population is starting to come back in the lake – several trout size records have been set at Pyramid. The Swift in the front of the photo is based in Carson City, NV though it’s owner lives in Hawaii. The plane was at Minden to have an avionics fan installed behind the instrument panel. This plane was the Grand Champion trophy winner at the West Coast Swift Fly-in last September. Beautiful plane – and for those techies out there, it is fitted with a Glass Panel – if you look closely at the large photo you will see all the antennas on the top of the fuselage. 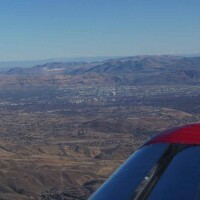 It was a nice flight – obviously overcast, but clear and smooth under the high clouds. Great to get back into the air and out of the traffic pattern. I will be up again later this week with a friend from Stead. He wants to get some hands-on experience with his iPad Mini, ForeFlight and his dual GPS for the iPad. I’ll fly and he’ll tap away on the various screens – much safer than trying to do both and accomplishing neither very well. 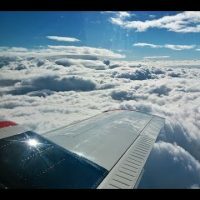 I have the same alerts for aviation articles that I have always had – used to find the articles that I have been passing along to you for a couple of years. Google’s latest algorithm changes must have caused a major change in the way their alerts produce results. I haven’t found anything at all worth passing along in a couple of months. 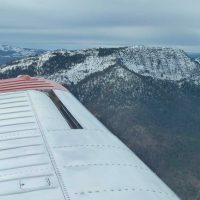 Most of the interesting articles that I come across are in either the AOPA or AvWeb email newsletters – which you are probably already receiving (or should have subscriptions). Maybe the article traffic will pick up as the flying season gets started. We’ll have to wait and see. Take care and fly often and fly safe. Whew, I’m relieved to hear from you and to learn that all is well. I too have not seen a lot of flying interest in recent weeks and, like you, must conclude that it is a seasonal thing. In the primary picture, just beyond the stealth swifts, is another, in red and silver. It looks familiar… I’m delighted to hear that the annual is done and with no apparent $trauma this year. Our weather is much warmer than yours, but still cold and low clouds are the seasonal norm. We’ve not seen anything above ~52 in many months. Despite the other challenges, we’ve been flying enough to avoid (his) currency issues. More in a private note, later. In short, my sponsoring captain was exceptionally fortunate. Everyone is delighted, save his wife . Ever flown with unlicensed, essentially untrained Safety Pilot? A short summary will follow in a bit. And Heavens yes, I’m sure that the rest of your audience is delighted to hear from you. The only recent sky fallings seem to be in Siberia. Regards, -C.
There you are! I was wondering what happened to you, too. You usually remind me when I’m shirking my writing duties too long. Life gets in the way of everybody now and then. I thought about the sky falling comment you made when I typed the title. Lots of video coverage of the event thanks to dashboard video cameras in the cabs there. I knew it was off season and you were busy with the annual stuff – and you can read the calendar as well as I can. I’m just glad that you’re back. Mega-busy with late winter land management stuff, but I’ll send the important update as soon as I can. Yup, we can fly! -C.